If you’ve been with us from the beginning, you may recall the essay ‘A Poster Story’ that appeared in the second issue of EQPR. Now, the pen poster is ready for the collector’s wall! It’s in full color and measures a substantial 20”X30”. 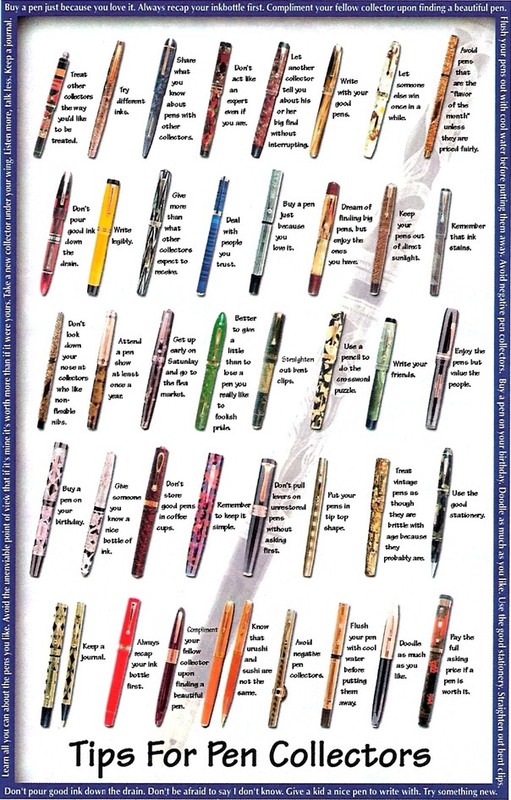 The poster includes forty top examples of vintage classics and a smattering of contemporary and custom made pens. Beside each pen is a collector’s tip from the original essay. Poster is limited to 1,000 copies and shipped in a protective tube. Cost is $19.95 plus $5 shipping. Buy a pen just because you love it. • Always recap your inkbottle first. • Compliment your fellow collector upon finding a beautiful pen. • Flush your pens out with cool water before • putting them away. • Avoid negative pen collectors. • Buy a pen on your birthday. • Doodle as much as you like. • Use the good stationery. • Use price guides as companions to your own good judgment. • Don’t pour good ink down the drain. • Straighten out bent clips. • Don’t be afraid to say, ‘I don’t know’. • Give a kid a nice pen to write with. • Learn all you can about the pens you like. • Avoid the undesirable point of view that if a pen is mine it’s worth more than if it were yours. • Take a new collector under your wing. • Try something new. • Treat other collectors the way you’d like to be treated. • Treat vintage pens like they are brittle with age because they probably are. • Listen more, talk less. • Share what you know about pens with other collectors. • Don’t act like an expert, even if you are. • Let the other collector tell you about his or her big find without interrupting. • Write with your good pens. • Avoid pens that are ‘the flavor of the month’ unless they are priced fairly. • Don’t look down your nose at collectors who like non-flexible nibs. • Know that urushi and sushi are two different things. • Give more than what other collectors expect to receive. • Deal with people you trust. • Dream of finding the big pens, but enjoy the ones you have. • Keep your pens out of direct sunlight. • Remember that ink stains. • Attend at least one pen show a year. • Use a pencil to do the crossword puzzle. • Keep a journal. • Write legibly. • Get up early on Saturday and go to the flea market. • Write your friends. • Give someone you know a nice bottle of ink. • Don’t store good pens in coffee cups. • Remember to keep it simple. • Don’t pull levers on unrestored pens without asking first. • Better to give a little than to lose a pen you really like to foolish pride. • Try different inks. • Pay the full asking price if a pen is worth it. • Above all, be fair. New and current EQPR subscribers can obtain their poster for $14.95 plus shipping. No additional shipping charged for extra posters shipped to the same address. EQPR P.O. Box 1385, Ballston Lake, NY 12019 (Don’t forget to include the shipping charge).